Avelino Vieira (blue) bagged Peterborough Sports 100th goal of the Premier Division season at Oadby. Peterborough Sports bagged their 100th United Counties Premier Division goal of the season during a 6-0 win at Oadby today (January 21). Top scorer Avelino Vieira fittingly grabbed the landmark goal - the third of the 27th league game of the campaign - with his first of a second-half hat-trick. Vieira’s second goal - the fifth of the match - was the club’s 150th goal in all competitions, a staggering acheivement before the end of January. Courtney Meade scored the winning goal for Stamford AFC against Bedworth. Star striker Mark Jones missed the game because of injury, but replacement Stuart Eason claimed the first two goals of them before Jordan MacLeod made it 3-0 before the break. Sports are now eight points clear at the top. Rivals Eynesbury’s scheduled home game with out-of-form Holbeach United was postponed enabling Deeping Rangers to return to second spot after a 2-0 home win over Cogenhoe. Scott Mooney’s cross was deflected into the net by a visiting defender to give Deeping a half-time lead before a fine pass from recent signing Tom Waumsley was finished off by Jason Kilbride late in the game. Yaxley made it four wins in all competitions on the spin without conceding a goal by seeing off FA Vase hopefuls Newport Pagnell 2-0 at In2itive Park. 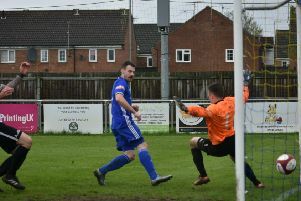 Pagnell knocked Peterborough Sports out of the prestigious knockout competition two weeks ago, but have since been beaten by Wisbech and Yaxley. Peterborough Northern Star goalkeeper Dan George saves a penalty at Wellingborough. Photo: Tim Gates. Dan Cotton shot the Cuckoos in front before the break and Liam Hook added a killer second goal in the second half. Yaxley are fifth, but right on the heels of the top four. Wisbech Town missed their chance to climb the table by losing for the first time in 17 competitive games at home to a decent Sileby Rangers outfit. Peterborough Northern Star's Eric Makate in action at Wellingborough. Photo: Tim Gates. The Fenmen led 2-1 at the interval through goals from Billy Smith and Alex Beck, but the Northampton-based side were oustanding in the final 45 minutes. Peterborough Northern Star were showing signs of progress before Christmas, but they are now on a run of seven games without a win after losing 2-0 at Wellingborough Town today, and that after goalkeeper Dan George had saved a penalty. Star fought hard and had chances at 1-0 down, but couldn’t find a finish. In Division One Blackstones’ resurgence under new boss Andy Lodge continued with an excellent 4-3 home win over high-flying Buckingham Town. Josh Russell (2), Ben Porter and former Posh full-back Gareth Jelleyman scored for Stones who are now just a point and a place behind local rivals Bourne. Bourne are 14th after pushing leaders Daventry all the way away from home. Two Jake Mason goals had Bourne level at half-time, but it was the title favourites who found the second-half goal. Spalding United maintained their promotion push in Division One South of the Evo Stik Northern League with a battling win at lowly Rugby Town. It looked curtains for the Tulips when a red card for violent conduct for Neal Spafford was followed quickly by a home goal. But top scorer Brad Wells soon levelled and Brad Baraclough’s first goal for the club sealed the win. Spalding are six points behind leaders Shaw Lane, but six points ahead of third-placed Newcastle Town. Stamford AFC moved up a place to 15th with a 2-1 home win over mid-table Bedworth. Karl Whymark’s opener for the Daniels was cancelled out before the break, but Courtney Meade popped up with the winner 18 minutes from time. And there was an excellent win for March Town in Division One of the Thurlow Nunn League. The Hares pipped fourth-placed Diss Town thanks to a goal five minutes from time from Rob Conyard. Daventry Town 3, Bourne Town 2 (Mason 2). March Town United 1 (R. Conyard), Diss Town 0.